daydreams and simple things | The daily musings and big dreams of a girl trying to survive college. The daily musings and big dreams of a girl trying to survive college. So in Salzburg I learned that a long time ago boys used to climb up into the mountains to pick Edelweis for their sweethearts. That sounds adorable, but apparently it’s actually super dangerous to climb up the Alps. It’s also apparently a protected plant because it is so dangerous to pick. So I think I’d rather have a dude stick around for years instead of die trying to pick a flower to prove his devotion for me. On that note, I think I’d rather have a guy pick wildflowers for me instead of buy a bouquet. It means more, that he spent the time searching and personally picking flowers he thought I would like. Plus a eclectic bouquet of different wildflowers is less serious and more fun that a red rose. 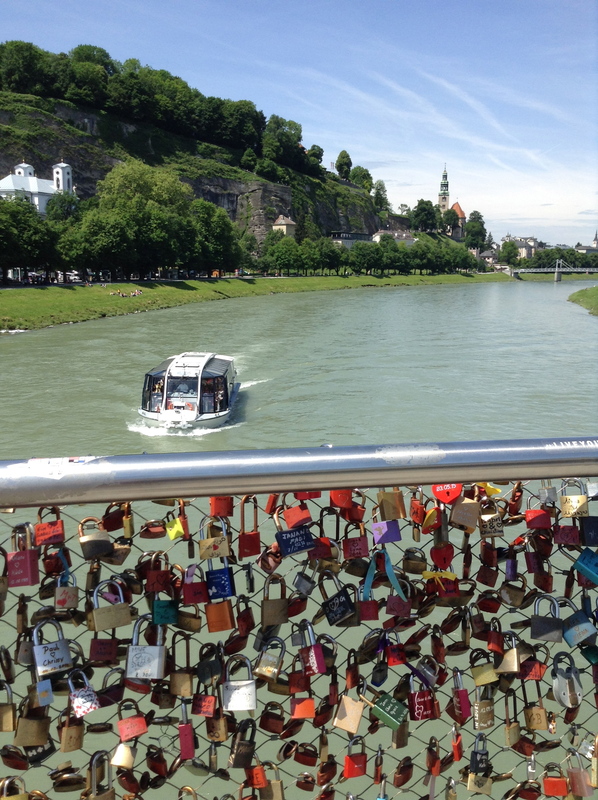 Salzburg was one of my favorite cities I’ve been to. With a population of 137,000, it’s not too overwhelming. You can wander the streets for hours and tour all the shops and cafes, walk along the river under the shade of the trees, or go on a bike ride on Salzburg’s perfectly paved bike trails. 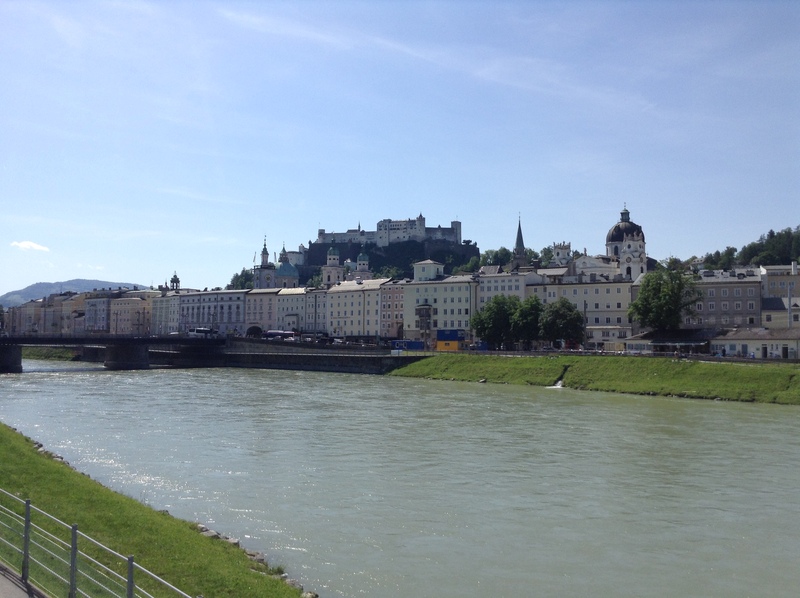 My family and I went on Fräulein Maria’s Bike Tour, which lasted 3.5 hours and covered 8 miles of Salzburg and sights from the Sound of Music. I think it was definitely worth the money, and, if I had it to do over again, I would have done that when I first arrived at the city. That way I would have gotten a comprehensive overview of the city and could determine what parts I wanted to spend more time in. Everyone talks about how fast-paced the American lifestyle is, and I don’t think I realized how much it was until I got here. Here, you have to motion when you want the check, or else the waiter will just let you sit and enjoy the night at the restaurant. Here, people sit out on the street drinking coffee and enjoying each other’s company. Here, most shops close early and on Sundays. I don’t want to completely idealize Germany and Austria and bemoan how America is. I just feel like we can take a lesson from this culture and take ourselves a bit less seriously and spend our time where it counts. We can be less busy with work and school and more busy with family and friends. We can turn off our TVs and technology and maybe go on a bike ride or grab some ice cream. Overall, this has been a great experience and I can’t wait to see where the journey takes me next! (1) Don’t drive down the main road in Hallstatt. It’s pedestrian only. I know now from experience. (2) Lederhosen can actually look good on the right people. (3) Wiener Schnitzel is not a hotdog. It’s the national dish of Austria and is like a fried strip of thin pork. (4) If you’re looking for thousands of pieces of chocolate with Mozart’s face on it, then Salzburg is the place for you. (5) You may be woken up by drunk Austrians singing in the restaurant below you at 12 in the morning for thirty minutes. Never fear, they’re just having fun. (6) If you get strawberries from the market, wash them thoroughly and individually. They may have bug(s) on them. (7) Eat as much gelato here as possible while it’s cheap. I got a scoop on a cone for only a Euro in Obersdorf, Germany. (8) Smoking is everywhere. People just do it openly. Don’t they know it’s so bad for your health? Then again, they could counter that by talking about America’s portion sizes and whatnot. (9) “Flat” water is hard to find. We had to search and search Hofer for “still” water, as it’s called. They also have a pickled version of carbonated water that’s kind of interesting and not super pleasant. (10) German chocolate is a good thing. Yes. Try it. 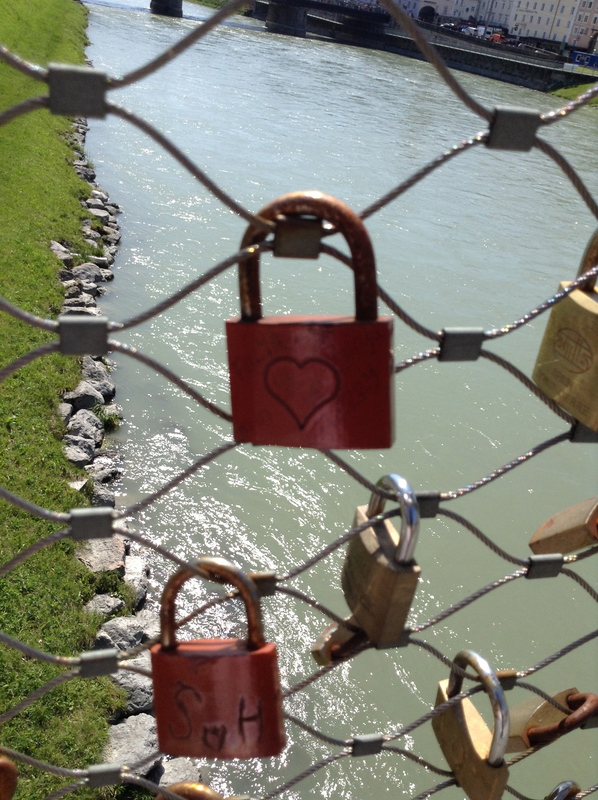 There is a love lock bridge here and it completely excited my inner romantic. Also, the markets (or markts, as they’re spelled here) sell fresh cut flowers. It’s the perfect scene for a Nicholas Sparks novel. Ahhhh the feels. So many feels. One of my favorite things about the airport is the people watching. There’s people rushing, people waiting. People coming, people going. Connections between flights, connections between people. It’s a hub of busyness and entertainment, and all you have to do is find a comfortable chair and watch. So far, my journey today started at 4:35am at home, and has taken me to Chicago and now to Philadelphia, where I have five whole hours to people watch more. On the way to Chicago I saw two businessmen with hair so gelled that the midwest winds wouldn’t be able to move it. On that same flight there was a lady going up to Green Bay to judge a competition and a lady who spent three summers in Switzerland back in high school. The flight over to Pennsylvania saw an older gentlemen with a journal and bag of art supplies and glue sticks, a hockey fan named Joey who was renting a tux for a wedding, and a man reading a book in Hebrew. And now, waiting at the International Terminal, I watch people come back home and others see America for the very first time. I always wonder about the lives of the people I see at the airport. Would I be friends with the girl sitting next to me if we happened to end up in the same place some day? Do the business men get tired of shining their shoes and traveling every weekend? I also think about the workers at the airports. Do they ever get jealous of watching thousands of people go on adventures every day while they’re stuck at work? Do they get tired of frantic travelers rushing from place to place? Nowadays, we have the ability to be constantly connected to our friends, family, and jobs through social media and technology. But sometimes, I feel like we feel so detached, in our little bubbles, tapping away at rectangular devices. Through our phones, we are connected – to people, to the news, to the inter web of ideas – but we feel all alone. That’s why airports are magical. 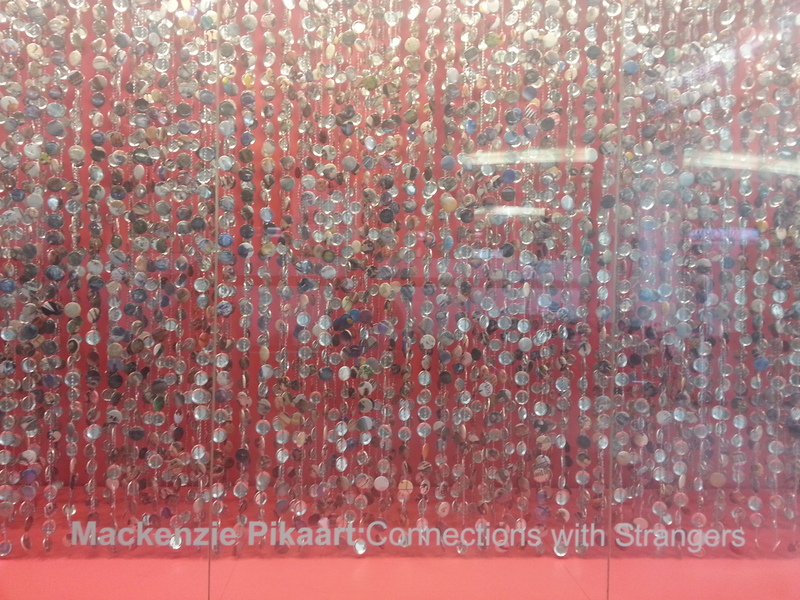 Though I’m not a huge fan of talking to strangers, for this brief moment in time we’re all in the same place. And for once, amid politics and different opinions and what not, it feels like we’re all on the same team, with the same goal of reaching our destination. Even though I don’t know all their names or their stories or reasons for traveling, all of our stories intersect for the span of the flight. We’re all connected. And for some reason, I find that there’s something strangely wonderful about these brief encounters between complete strangers. 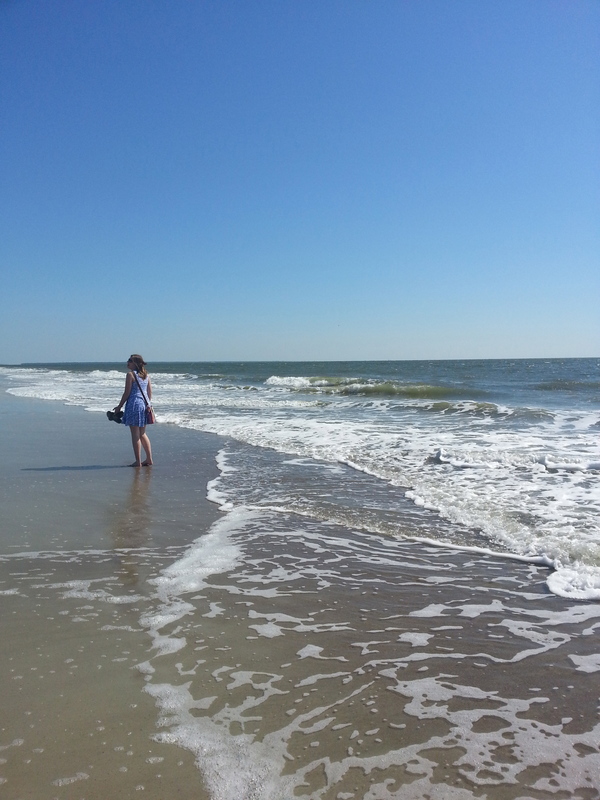 Last year’s adventure with one of my best friends (featured here) on Tybee Island. Although I’d like to think I’m quirky and unique (and I’ve been told I’m “special”…), I’m really like many people my age. Just like many other college kids, for nine months of the year I’m crammed into a dorm, dreaming and procrastinating and stressing, trying to find my place in the world. And often times I find myself wishing I was going on adventures instead of studying organic chemistry in the bottom of the library. Throughout any given day, I have many adventures…in my head. In some, I’m acing a test or not tripping as I walk down the sidewalk. In other more extravagant ones, I’m eating lots of chocolate without the fear of getting fat and getting into any pharmacy school of my choosing. And in even more exciting dreams ones, I’m off traveling the world. Although it’s one of my favorite things to do, traveling can be a negative form of escapism from normal circumstances. Sometimes I get so wrapped up in planning imaginary trips or making future plans. I forget that the decisions I make here and now often determine if I’ll end up where I’d like to be. Traveling also gives me romantic notions about how life-changing the journey will be. Not romantic as in some Nicholas Sparks romance where two people with rough pasts somehow learn to mend each others’ wounded hearts. Romantic as in overly idealistic, everything-is-roses-and-butterflies sort of feelings. I feel like everything would be perfect if I could just live in (fill in the blank), even though I know logically that it isn’t the case. I feel like traveling will help me find me and discover intrinsic and life-changing truths about myself that could be found no other way. Hence the quote by Emerson. Emerson was a pretty idealistic guy who said stuff like, “Trust thyself: Every heart vibrates to that iron string,” yet even he cautioned against traveling to find yourself or be amused. As I was pondering over his words and thinking about the upcoming adventure that awaits, I thought of these things to think about and caution myself with before I go. (1) Traveling merely for the sake of “discovering yourself” is futile. Who you are is what you do and the character that you have on a normal day, not on some wonderful, extraordinary trip that you take once in your lifetime. (2) Also, traveling with the desire to impress people with Instagram posts of beautiful pictures and how “cultured” you are also ends up lacking worth in the end. You’d just end up with pride and selfishness and photographs of places that you saw and posted but didn’t necessarily experience. Therefore, on this new adventure, I’m attempting to aim my expectations on something higher. A greater appreciation for God’s creation and His people and their cultures around the world. Further dependence on God because of cultural barriers and all the uncertainty involved. A genuine belief that, if traveling is great and the world is beautiful, the Creator of this beauty must be even more great and more worthy of seeking and pursuing. A mindset of peace, deference, and flexibility as I’m traveling with students from my college whom I don’t know and won’t always be in control of what I’m doing. I was cleaning out my room back home after college and discovered so many crafts and projects that I never ended up finishing. There’s the rug I started making in the 8th grade, the pillowcase I was trying to embroider in 7th, and then countless journals that I started and only stuck with to for a couple months, to name a few. Thankfully, these projects are completely content to just chill in my room until I dig them out again once a year to work on for a day. Unfortunately, my lack of commitment has been noticeable in other areas of my life. For example, there’s all those, “Hey, we should get coffee some time!” dates with people I haven’t seen in forever that never actually happen. Or the clubs I started freshman year but never attended more than a handful of meetings. Or the guitar that sits in my room that I told myself that I’d actually learn to play. Or the Facebook invites that I say “maybe” to because I don’t want to commit one way or another to. Or the New Years Resolutions that I write and completely forget about after March. Further yet, there’s the quiet times I’ve skipped because I was “too busy” with other things. Or the memory verses I promised myself I would work on that are written on 3×5 notecards but not on my heart. Or the friends I’ve made who have fallen out of my thoughts. Commitment is hard. Commitment to projects is one thing. They don’t have feelings. But commitment to people is even harder. It’s like, if I can’t commit to a blog theme or a nail polish color, how am I ever supposed to commit to anything serious? I think one reason why I’m such a commitment-a-phobe is because I like to keep my options open. Another is because of pure selfishness and pride. I wrongly think that the things I have to do are always way more important than anyone else’s. Therefore, I don’t want to promise that I’ll help them if it means inconveniencing myself. Commitment is also terrifying. The thought of giving over significant amounts of time and energy and emotions into a person to have them reject me is painful. Although it’s hard, commitment is the only way to find real meaning and purpose in our lives. Sure, commitment takes up our time and forces us to be vulnerable, but it’s worth it. Friendships are messy sometimes, but they are worth it. People are worth it. Or else, we’d just be like the balls in the pinball machines, bouncing off one person and one thing to the next without having any real identity or place to call home. No one would get a chance to know who we are and what we stand for and no friends would be around to share the good and bad moments of our lives with us. No one would know the dark parts of our pasts and our quirks and still love us. No one would get a chance to understand us. And, from what I’ve experienced, the one thing most people innately want is to be loved and understood. There are no real friendships or relationships without some vulnerability and commitment. Thinking even deeper, though I cherish my family and friends, there’s no meaning apart from a relationship with God. Or else we all live and breathe and die. And the cycle goes on and on. It wouldn’t matter what we discovered or the relationships we formed. None of that would last without God. All would be meaningless. Commitment to God is something that is hard for me to comprehend. The idea that the Creator of the world who knows all the horrible things about me sacrificed His time and His Son just to have a relationship with me is incomprehensible. He knows all my failures and my weaknesses more than I know, yet He is willing to commit to me. Better yet, because of Jesus, nothing gets in the way of Him committing to me, even though I get distracted from my commitment to Him by the stupidest things – social media, school work, and social activities. I don’t deserve it. That’s what makes it all the more amazing and astonishing. That what makes me strive more and more to commit every area of my life to Him. So yes, I still have a hard time fully committing to things, to people, to God. Let’s be real, I’ll place those projects back into their proper space in my room to remain untouched for another three months. Maybe I’ll grab coffee with those people, although they’ve probably already forgotten all about it. There are thousands of school activities and personal goals that I could commit to doing, but I have whittled it down to three: (1) to love and obey God and to seek after Him daily, (2) to do everything I do to the best of my ability for God’s glory, and (3) to love and serve people, whom God also loves. Boulders, Buffalos, and Bonfires Oh My! School has been pretty hectic lately, so two weeks ago my friends and I decided to embrace nature. 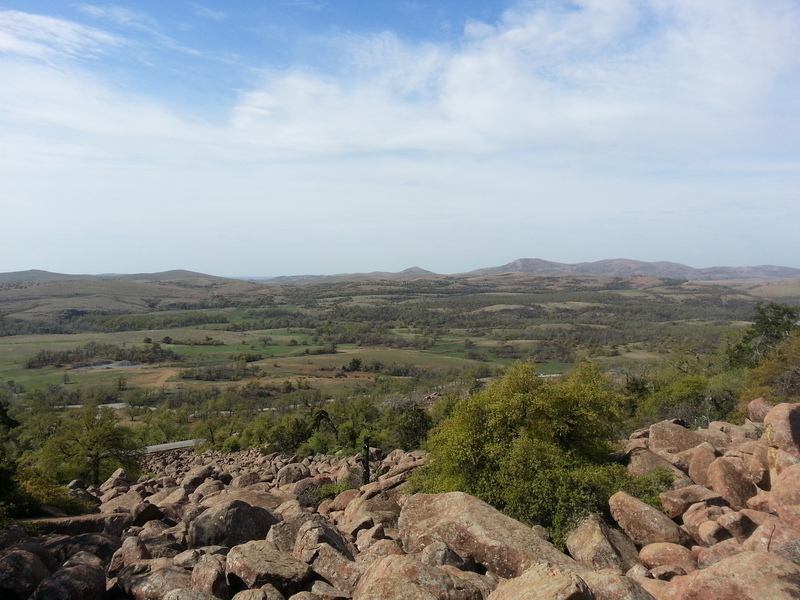 We left to go to explore the Wichita mountains outside of Lawton, Oklahoma. So we packed up my car, got a few drinks at Sonic, and were on our way for a ninety minute car ride that included singing Imagine Dragons at the top of our lungs. Once we arrived at the reserve, I was in for a surprise. There was this big brown mass in the field on the side of the road, and we all didn’t know what it was. As we approached, we realized it was a buffalo! Excuse my ignorance, but I didn’t know roaming buffaloes were still a thing. Apparently they are since we saw a few over the trip. That night we did the typical camping stuff – set up tents and hammocks, passed a football around, had a bonfire, and sang songs. 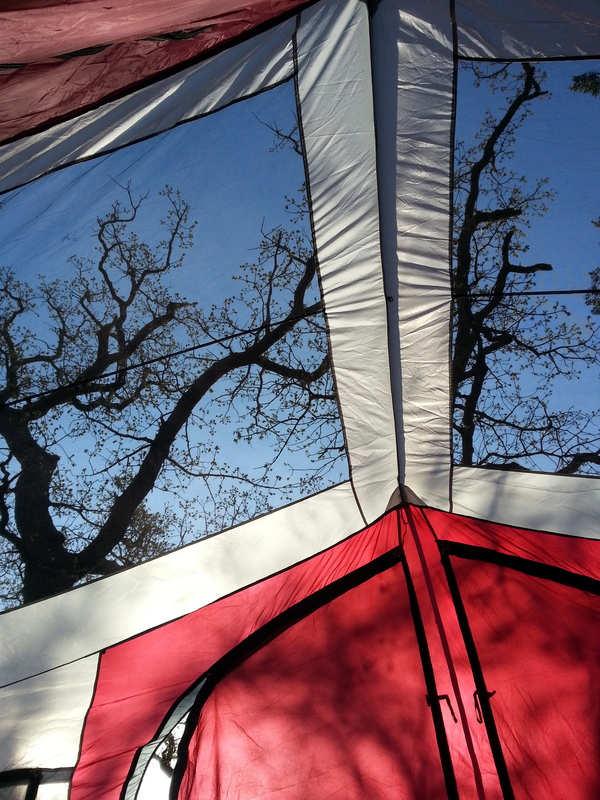 The next morning, I woke up and was blessed with this beautiful view from inside the tent. As you can see, it was a beautiful day to go hiking. We ended up scrambling up a bunch of huge boulders on one side of Mt. Scott. Focusing on hopping from one boulder to the next helped me forget the things I left behind back in the city – homework, a job, etc… It was lovely to be able to get away from the city lights and fast-paced world and bask in the sun.